Showing results for tags 'Korriban'. 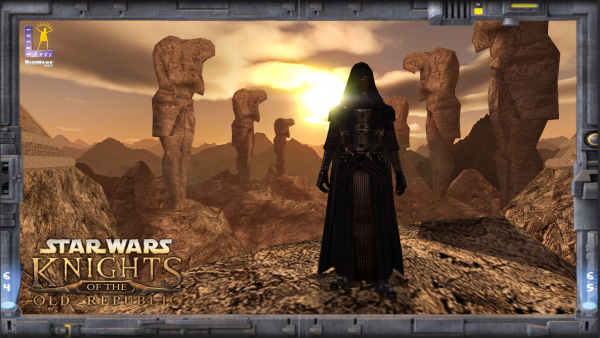 Mods featured in the wallpaper are: Kexikus' "High Quality Skyboxes": JCarter426's "JC's Minor Fixes for K1 - PMBJ01 [Darth Revan's robe Resolution Fixes]": Sithspecter's "Revan's Flowing Cape and Belt Fix": Kristy Kistic's "Darth Revan Cutscene Force Power Fix (1.02)"
File Name: Dustil Restoration File Submitter: Fallen Guardian File Submitted: 30 Sep 2013 File Category: Mods TSLRCM Compatible: Yes In KotOR 2, you would originally stumble upon the body of a Jedi named Nebelish while investigating the tomb of an ancient Sith Lord on Korriban. However, this "Nebelish" actually looked a lot like Dustil Onasi. Turns out, Obsidian originally planned to have Dustil in the tomb but they ended up cutting the content. Now when TSLRCM came along they never restored this because Jason Mardsen, Dustil's voice actor, never recorded any lines for the part. Now I thought it a shame that Dustil couldn't have been restored, so I set about restoring him. And, thanks to some voice overs done by Zhaboka, I have finished my task. 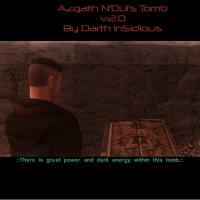 So essentially, this mod restores Dustil to KotOR II. At last it is done. TSLRCM Compatible: Yes. ReadMe ~~~~~~~~~~~~~~~~~~~~~~~~~~~~~~~~~~~~~~~~~~~~~~~~~~ » Dustil Restoration ReadMe ~~~~~~~~~~~~~~~~~~~~~~~~~~~~~~~~~~~~~~~~~~~~~~~~~~ NAME: Dustil Restoration TYPE: Restored Content VERSION: 1.0 SIZE - Unzipped: 434 Megabytes, Zipped: 337 Megabytes DATE RELEASED: September 30, 2013 ~~~~~~~~~~~~~~~~~~~~~~~~~~~~~~~~~~~~~~~~~~~~~~~~~~ » DESCRIPTION ~~~~~~~~~~~~~~~~~~~~~~~~~~~~~~~~~~~~~~~~~~~~~~~~~~ In KotOR 2, you would originally stumble upon the body of a Jedi named Nebelish while investigating the tomb of an ancient Sith Lord on Korriban. However, this "Nebelish" actually looked a lot like Dustil Onasi. Turns out, Obsidian originally planned to have Dustil in the tomb but they ended up cutting the content. Now when TSLRCM came along they never restored this because Jason Mardsen, Dustil's voice actor, never recorded any lines for the part. Now I thought it a shame that Dustil couldn't have been restored, so I set about restoring him. And, thanks to some voice overs done by Zhaboka, I have finished my task. 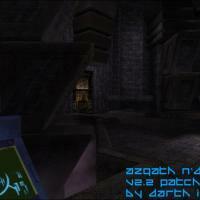 So essentially, this mod restores Dustil to KotOR II. ~~~~~~~~~~~~~~~~~~~~~~~~~~~~~~~~~~~~~~~~~~~~~~~~~~ » INSTALLATION ~~~~~~~~~~~~~~~~~~~~~~~~~~~~~~~~~~~~~~~~~~~~~~~~~~ An installation which involved the TSL Patcher has been made ready for your use. It is the simplest and easiest way to carry out installation. If you wish, for whatever reason, to not use the TSL Patcher it will require you to manually copy and paste files from the Alternate, Added Installations folder into specific folders within the game's directory. Note: I am not responsible for any incompatibility issues that may arise from the use of this mod in conjunction with other mods. (Though I'll help you try and sort them out, if you tell me about them.) ~~~~~~~~~~~~~~~~~~~~~~~~~~~~~~~~~~~~~~~~~~~~~~~~~~ » TSL PATCHER INSTALLATION ~~~~~~~~~~~~~~~~~~~~~~~~~~~~~~~~~~~~~~~~~~~~~~~~~~ 1) Double click Dustil Restoration v1.0 Installer.exe found in the main directory of the Dustil Restoration folder. 2) Choose which version of the mod you would like to install. 3) Click the button labeled Install Mod. 4) Click yes to the box that'll pop up... if you wish to proceed with installation. 5) Watch as all the little file names and progress reports scroll by and wait until the installer is complete. NOTE: If you use TSLRCM this mod MUST be installed AFTER TSLRCM. NOTE 2: If you are using the Added Content Installation, but you do not use TSLRCM then you must do some manual installation. Navigate to the alternate, added installations folder found in the main Dustil Restoration directory. Once there, go into the "Non-TSLRCM Install Addons" folder, and then into the "For Override" folder. Once inside the For Override folder copy the files within there and paste them into the override found within your SWKotOR2 main directory. NOTE 3: Once this mod has been installed, do not install it again. If you want to install it again, make sure that it has been completely uninstalled before doing so. Installing it onto a game that already has Dustil installed will break certain parts of the mod and most likely break the game as well. IMPORTANT! If you encounter a warning while running the TSLPatcher saying that 711KOR.mod already exists, DO NOT worry. This just means a little insurance policy I had in place wasn't needed. IMPORTANT 2! If you encounter warnings about revan.dlg while installing the Added Content Installation it means you do not have TSLRCM 1.8.2 installed. Because I cannot set the installer up to accommodate both TSLRCM and non-TSLRCM users, you will usually only get the warning when trying to install onto a vanilla game. There are two things you can do at this point: 1) If you want to play the game without TSLRCM, you can ignore the warning and, after the installer is finished, go into the Alternate, Added Installations folder. Once there, go into the folder titled "Non-TSLRCM Install Addons." Inside you will find a folder marked "For Override," open that folder up. Copy the files from there and paste them into the Override folder found within your SWKotOR2 main directory. 2) If you want to play the game with TSLRCM, scroll down to the uninstallation instructions of this ReadMe. Once there, follow the directions on how to uninstall this mod. Once the mod is uninstalled, install the newest version of TSLRCM and then install this mod. ~~~~~~~~~~~~~~~~~~~~~~~~~~~~~~~~~~~~~~~~~~~~~~~~~~ » MANUAL INSTALLATION ~~~~~~~~~~~~~~~~~~~~~~~~~~~~~~~~~~~~~~~~~~~~~~~~~~ 1) Go into the folder labeled "Alternate, Added Installations", found within your Dustil Restoration folder. 2) Open up the folder titled "Manual Installation". 3) Choose which version of the mod you want to install, and recall if you've installed TSLRCM or not. FOR THOSE WISHING TO INSTALL THE ADDED CONTENT RESTORATION 1) If you have TSLRCM installed, open the folder titled "TSLRCM Added Content Manual Installation". If you do not have TSLRCM installed, open the folder titled "Non-TSLRCM Added Content Manual Installation". 2) Within those folders you will see subfolders labeled as "For Override", "For Modules" etc. These correspond to a certain file in the SwKotOR2 main directory. For Override corresponds to the override folder, For Modules corresponds to the modules folder and so on. 3) Copy the files from their specific subfolders to their corresponding subfolders within the SWKotOR2 main directory (the default path for the game’s directory on Windows 7 is C:\Program Files (x86)\LucasArts\SWKotOR2). FOR THOSE WISHING TO INSTALL THE PURE RESTORATION 1) If you have TSLRCM installed open the folder titled "TSLRCM Pure Restoration Manual Installation". If you don't have TSLRCM installed open the folder titled "Non-TSLRCM Pure Restoration Manual Installation". 2) Within those folders you will see subfolders labeled as "For Override", "For Modules" etc. These correspond to a certain file in the SwKotOR2 main directory. For Override corresponds to the override folder, For Modules corresponds to the modules folder and so on. 3) Copy the files from their specific subfolders to their corresponding subfolders within the SWKotOR2 main directory (the default path for the game’s directory on Windows 7 is C:\Program Files (x86)\LucasArts\SWKotOR2). (I TAKE NO RESPONSIBILITY FOR ERRORS MADE WHILE MANUALLY INSTALLING THIS MOD) ~~~~~~~~~~~~~~~~~~~~~~~~~~~~~~~~~~~~~~~~~~~~~~~~~~ » UNINSTALLATION ~~~~~~~~~~~~~~~~~~~~~~~~~~~~~~~~~~~~~~~~~~~~~~~~~~ For Added Content Installation users: 1) Navigate to your SWKotOR2 main directory (the default path on Windows 7 is C:\Program Files (x86)\LucasArts\SWKotOR2). 2) Open up the Override folder. 3) Delete all files beginning with the prefix "dr_" (without the quotes, of course). 4) Go back into the SwKotOR2 main directory, then go into the modules folder. 5) Delete 711KOR.MOD and dr_ebo_cs.MOD (this will cause any mods that alter 711KOR.MOD (TSLRCM comes to mind) to have their changes negated. You will need to reinstall those mods after uninstalling this mod). If you absolutely have to, it may be possible to not delete 711KOR.MOD. However, this has not been tested so it is unknown if bugs will arise from uninstalling every part of the mod except for the modified 711KOR.MOD. For Pure Restoration Installation users: 1) Navigate to your SWKotOR2 main directory (the default path on Windows 7 is C:\Program Files (x86)\LucasArts\SWKotOR2). 2) Open up the Override folder. 3) Delete all files beginning with the prefix "dr_" (without the quotes, of course). 4) Go back into the SwKotOR2 main directory, then go into the modules folder. 5) Delete 711KOR.MOD (this will cause any mods that alter 711KOR.MOD, TSLRCM comes to mind, to have their changes negated. 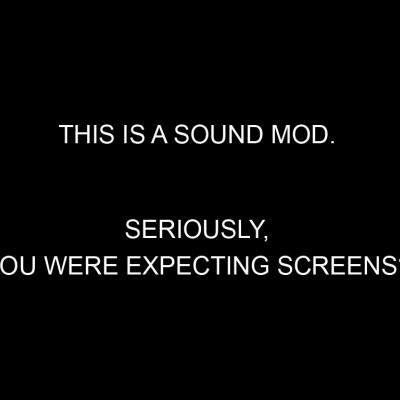 You will need to reinstall those mods after uninstalling this mod). This method of uninstallation does not uninstall the appearance.2da, heads.2da, soundsets.2da or the voice over files that this mod initially installs/modifies. This being because they do not make changes that are noticeable in any way and deleting them would either cause you loads of trouble, or waste my time on describing how to delete them. ~~~~~~~~~~~~~~~~~~~~~~~~~~~~~~~~~~~~~~~~~~~~~~~~~~ » KNOWN BUGS ~~~~~~~~~~~~~~~~~~~~~~~~~~~~~~~~~~~~~~~~~~~~~~~~~~ - Rarely the animated cameras for cutscenes will glitch out and it will remain in the default third person camera view, rather than a custom view. To fix this, load a save from before initiating that dialogue. ~~~~~~~~~~~~~~~~~~~~~~~~~~~~~~~~~~~~~~~~~~~~~~~~~~ » BUG REPORTING ~~~~~~~~~~~~~~~~~~~~~~~~~~~~~~~~~~~~~~~~~~~~~~~~~~ There are 3 ways to report bugs. 1: Post your issues in the Taris Upper City Emporium Release Thread. 2: Post your issues in the Deadly Stream Release Thread. 3: PM your issues to me (Fallen Guardian) at Deadly Stream or Lucas Forums. 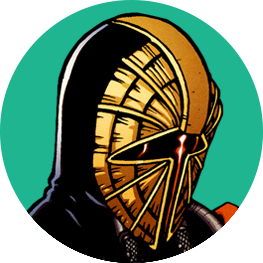 TO REPORT THROUGH TARIS UPPER CITY EMPORIUM 1) Go to the Taris Upper City Emporium section of the Knights of the Old Republic branch of LucasForums (http://www.lucasforums.com/forumdisplay.php?f=645) and either create an account or login to your existing one. 2) Find the thread titled "Dustil Restoration". 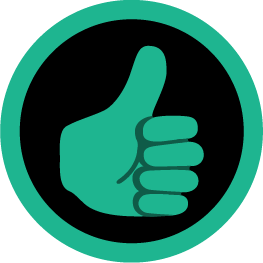 3) If the bug has not been reported already, post a VERY DETAILED description of what is occurring in your game. I will report back to you in a week. If I don't, feel free to try the 3rd method of reporting bugs, which is private messaging me. 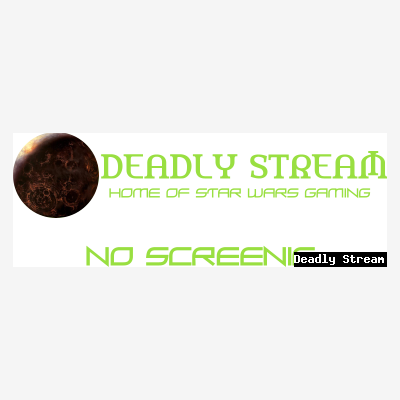 TO REPORT THROUGH DEADLY STREAM 1) Go to the Mod Releases Section of the Knights of the Old Republic branch of Deadly Stream (http://deadlystream.com/forum/forum/17-mod-releases/) and either create an account or login to your existing one. 2) Find the thread titled "Dustil Restoration". 3) If the bug has not been reported already, post a VERY DETAILED description of what is occurring in your game. I will report back to you in a week. If I don't, feel free to try the 3rd method of reporting bugs, which is private messaging me. TO REPORT THROUGH PM 1) Go to Deadly Stream (http://deadlystream.com/) or Lucas Forums (http://www.lucasforums.com/) and search for the user Fallen Guardian. 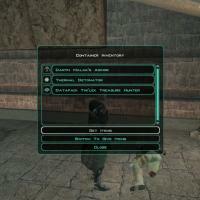 Lucas Forums: http://www.lucasforums.com/member.php?u=167390 Deadly Stream: http://deadlystream.com/forum/user/8932-fallen-guardian/ 2) Send me a private message with a VERY DETAILED description of what is occurring in your game. I will likely report back to you within a week. If I don't report back, well, you can wait a bit. If you've waited for a year, get over it. I'm probably never going to reply if I don't reply within a year. ~~~~~~~~~~~~~~~~~~~~~~~~~~~~~~~~~~~~~~~~~~~~~~~~~~ » SPECIAL THANKS ~~~~~~~~~~~~~~~~~~~~~~~~~~~~~~~~~~~~~~~~~~~~~~~~~~ Thanks to Zhaboka for voicing Dustil and bringing him to life. Also thank you to Zhaboka for beta testing. 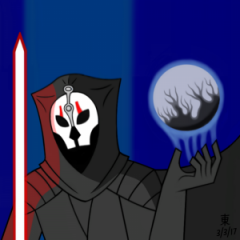 Thanks to Sith Holocron for beta testing. Thanks to Paddy Garcia for voicing Nebelish, as well as beta testing and proofreading. This mod would be in a sorry state without the three of you. Thanks! 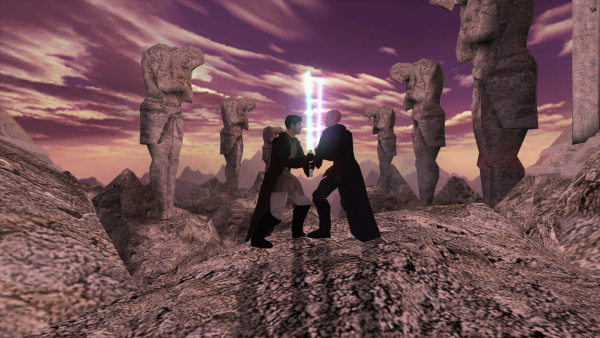 To the tool creators of the community ~ Kotor Tool.....................Fred Tetra ~ K-GFF GFF Editor/DLGEditor.....tk102 ~ ERF Editor/TSLPatcher..........stoffe ~ KotOR DeNCS Script Decompiler..JdNoa ~ Lipsynch Editor................JdNoa Also thanks to everyone over at Holowan Labs for helping me whenever I have problems with modding. ~~~~~~~~~~~~~~~~~~~~~~~~~~~~~~~~~~~~~~~~~~~~~~~~~~ » REDISTRIBUTION ~~~~~~~~~~~~~~~~~~~~~~~~~~~~~~~~~~~~~~~~~~~~~~~~~~ This mod may NOT be redistributed in any way without the explicit permission of myself (Fallen Guardian) and the proper credit given to me within the ReadMe. ~~~~~~~~~~~~~~~~~~~~~~~~~~~~~~~~~~~~~~~~~~~~~~~~~~ » LEGAL ~~~~~~~~~~~~~~~~~~~~~~~~~~~~~~~~~~~~~~~~~~~~~~~~~~ THIS MODIFICATION IS PROVIDED AS-IS AND IS NOT SUPPORTED BY BIOWARE CORP/OBSIDIAN ENTERTAINMENT OR LUCASARTS OR ANY LICENSORS/SPONSORS/OWNERS OF THE AFOREMENTIONED COMPANIES. USE OF THIS FILE IS AT YOUR OWN RISK AND THE AFOREMENTIONED COMPANIES/LICENSORS/SPONSORS/OWNERS/THE AUTHORS OF THIS MODIFICATION ARE NOT RESPONSIBLE FOR ANY DAMAGE CAUSED TO YOUR COMPUTER FOR THE USAGE OF THIS FILE. Screenshots ModDB Link: DOWNLOAD Nexus Files: DOWNLOAD Deadly Stream Link: DOWNLOAD (Same as the one below) Click here to download this file from Deadly Stream. A Mod for Star Wars Knights of The Old Republic Author: N-DReW25 Release Date: 30.01.2018 Installation: Simply Copy and Paste or Drag and Drop ALL the files within the "For Override" into your Star Wars Knights of The Old Republic override folder Uninstallation: Remove or Delete the files from your Star Wars Knights of The Old Republic override folder Description: In the Valley of the Dark Lords in K1 most of the Sith Archaeologist are female except for two named males. Discovered by accident, two of the four female Sith have been marked "male" in there character file and an unused dialogue exists with the lines the female Sith Archaeologist say but in a male VO. 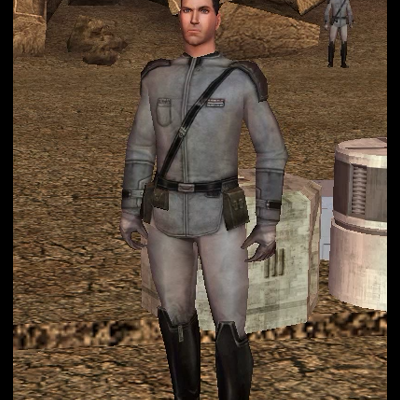 This mod turns the intended male Sith Archaeologist into males and gives them their intended male dialogue Known Bugs: None but if there is Just PM me on Deadlystream. 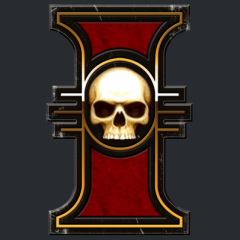 Incompatibilities: Will be incompatible with things that edits "kor36_sitharcheo.utc" "kor36_sithstudm.utc" Permissions: You are NOT allowed to claim this work to be your own Thanks: Bioware for such an amazing game Fred Tetra for Kotor Tool and everyone who downloads the mod. Legal: THIS MODIFICATION IS NOT SUPPORTED BY BIOWARE/OBSIDIAN ENTERTAINMENT, LUCASARTS, DISNEY OR ANY LICENSERS/SPONSORS OF THE MENTIONED COMPANIES. USE OF THIS FILE IS AT YOUR OWN RISK AND THE ABOVE MENTIONED COMPANIES OR THE AUTHOR IS NOT RESPONSIBLE FOR ANY DAMAGE CAUSED TO YOUR COMPUTER FOR THE USAGE OF THIS FILE. 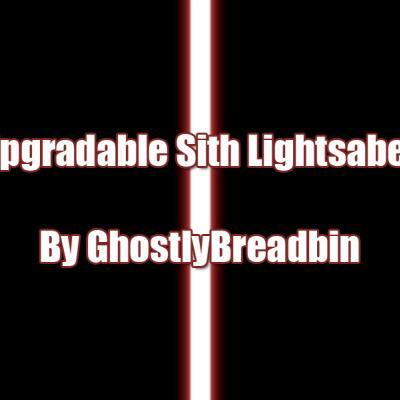 ========================================== A KNIGHTS OF THE OLD REPUBLIC MODIFICATION ========================================== TITLE: Upgradable Sith Lightsaber VERSION: 1.0 AUTHOR: GhostlyBreadbin DESCRIPTION: This is a simple little mod which allows you to upgrade the Sith Lightsaber you find in the Tomb of Naga Sadow on Korriban. It allows you to use each and every blade colour and power crystal that is available in the game. Admittedly, it is little more than a set of UTI edits and some 2DA tinkering to make the upgrade side of things work, but it makes for a more immersive experience when you can change the blade colour without having the description of the item itself change, if that makes sense. Not all Sith use the same colour lightsaber, right? The lightsaber itself can still be found in Naga Sadow's tomb as always, with the red crystal pre-installed. The other colour crystals are inside the statue as well, but you'll have to hunt down all the different power crystals yourself! I may well release a 2.0 version of this mod featuring a new hilt model later on, but i've only just started learning 3D and am not yet sufficiently skilled to create anything worth releasing publically. 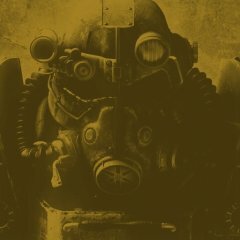 INSTALLATION: Run the included installer and the TSL Patcher will install the mod automatically. THIS MODIFICATION IS PROVIDED AS-IS AND IS NOT SUPPORTED BY BIOWARE/OBSIDIAN ENTERTAINMENT OR LUCASARTS OR ANY LICENSERS/SPONSORS OF THE MENTIONED COMPANIES. USE OF THIS FILE IS AT YOUR OWN RISK AND THE ABOVE MENTIONED COMPANIES OR THE AUTHOR IS NOT RESPONSIBLE FOR ANY DAMAGE CAUSED TO YOUR COMPUTER FOR THE USAGE OF THIS FILE. I have been messing around with the excellent Lost Modules resource, and would like to do something with the 2 most complete maps. The Czerka base on Korriban is pretty complete, and can be seen in some early screenshots. The cut shadowlands level is also usable, though there isn't any indication of what it was for. It is probable that content from the shadowlands was moved out of this module to reduce its size (this is obviously entirely speculative). I thought about NPCs that were underused, and immediately went to Garrum and Tar'eelok, the cut NPCs that duel with Vibroblades in the Jedi temple. They have basically no role except to offer Jedi Code exposition. They also use alien voice overs which is the most important consideration. The Czerka base is set up like a hallway, with a shield emitter at the far end, and the obvious plot involving a master and apprentice is to have the master get captured and the apprentice freak out. The Kashyyyk Shadowlands is also an excellent place to have Czerka dealing with the Sith outside of Korriban, as the Sith aren't really present on Kashyyyk, and it provides some interesting combat situations and potential conversation paths to turn less dedicated Czerka employees. Considering all that, I came up with this general story outline: 1. The Shadowlands lift Wookiees mentions that some heavily armed Czerka employees recently went into the Shadowlands after a ship crashed. 2. Entering into the cut Shadowlands level (either inserted in between the existing levels, or as a separate area entered from another entrance), you are attacked by Czerka guards. After fighting through them (or convincing some to run away), you meet Garrum. 3. Garrum has killed a lot of Czerka Employees and a Dark Jedi. You find out that Tar'eelok was captured. You deduce that the Czerka would take them to Korriban, as that is were Czerka and the Sith do business. 4. 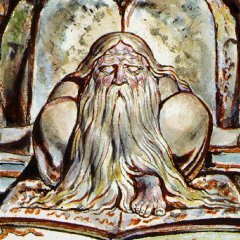 You then have 4 paths to follow with Garrum: 4. a. Persuade him to go to Dantooine (Light Side) 4. b. Let him go to Korriban Looking for Tar'eelok (Neutral) 4. c. Persuade him to seek Revenge on Korriban (Dark Side) 4. d. Kill him for being (or because you're) evil and giving in to anger (Dark Side) 5. 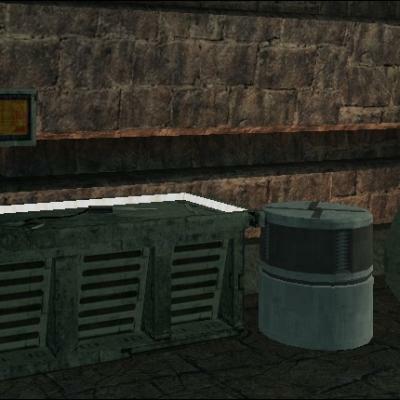 You then go to Korriban and enter the Czerka facility (with identification you found in the Shadowlands). 6. You fight through Czerka Employees and Combat Droids. If Garrum is on Korriban, you have to rescue him from a holding cell while making your way through the base. You then have another conversation. Garrum always stays back to recuperate and catch up to you later. You can push him towards the Light or Dark side in this conversation. 7. Upon shutting down the shield guarding the main room, you find a Dark Jedi and a Czerka Boss, with Tar'eelok in a force cage. Garrum catches up to you at this point. If you pushed Garrum to the Dark Side he electrocutes the Czerka Boss. Either way you fight the Dark Jedi (and the Czerka Boss if alive). 8. Tar'eelok's cage opens once they are both dead. If Garrum is Dark Side, Tar'eelok will be displeased, and piss off Garrum. There are multiple results for this scene depending on what happens: 8. a. If Garrum isn't there, you can let Tar'eelok go to Dantooine or kill her. She will be sad if Garrum is already dead, and may attack you if you say the wrong things. 8. b. If Garrum is Light Side or Dark Side and talked down, she will be happy he is controlling his anger, and they will both go Dantooine 8. c. If Garrum is Dark Side and not talked down, he can be allowed (or encouraged) to kill Tar'eelok. He then runs off 9. 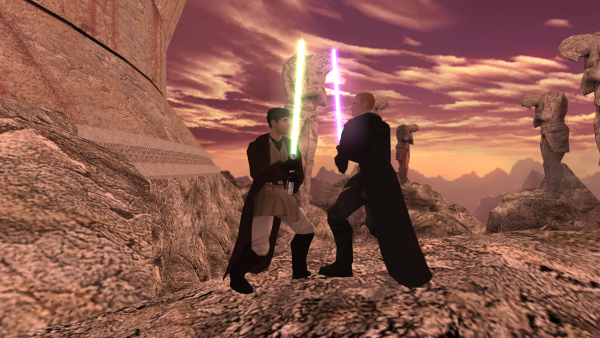 The player may return to Dantooine at this point. If either Garrum or Tar'eelok is alive they will appear. A few different ending permutations can happen: 9. a. Garrum and Tar'eelok are alive. They appear in the courtyard outside. Tar'eelok thanks you for helping Garrum control his anger, and he is now a Padawan (regardless of when you did it) 9. b. Tar'eelok appears in the courtyard outside. She is sad and doesn't think she'll take another Apprentice. She thanks you for saving her, but wishes you could have saved Garrum. 9. c. Light Side Garrum can be found in the courtyard outside. He will inquire about Tar'eelok. 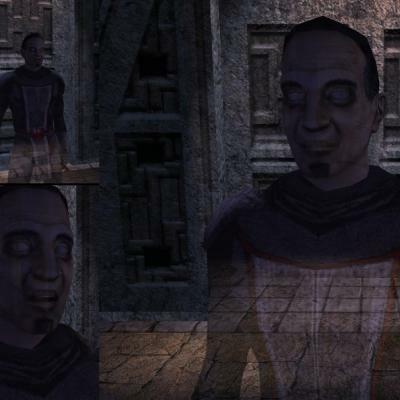 The player must lie, but he can say she died in the fighting, or was executed before the player arrived. He will be upset he didn't go to Korriban. 9. d. Dark Side Garrum can be found in a bar on Tatooine working to destroy Czerka for turning his master against him. He will run off to disrupt Czerka mining operations. I think this is a fair amount of reactivity, but isn't actually that complicated in terms of setting up dialogues and events. It also gives the player a lot of potential results without feeling too contrived obviously. This is totally conceptual, but I think it makes a good use of these areas, and adds another mulitple planet spanning side quest, which are my favourite parts of the game. My friends and I went to Korriban last winter (KotOR/TSL inspired fan film) Enjoy! 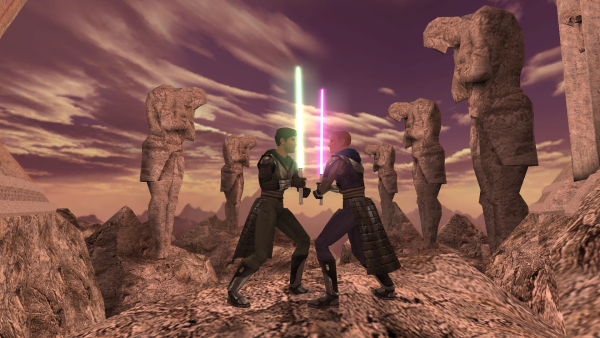 I've always loved KotOR. This is the trailer for a passion project set during KotOR era and I thought I'd share it with you guys! Enjoy! Any questions/comments feel free to share!